We purchased "Delight" from the Weirs of Double J Farms at the 2017 Fall Splash of Color Sale. Delight is a beautiful Red doe direct out of the late 3LF STARGATE and a Black Jagger daughter. Great length and elevation, plenty of bone and muscle shape coupled with a pretty head and horn set. Don't let her red color fool you. She has 2 full sisters that are Black and Tan Spotted. We purchased Gypsy Rose from Mark Seabolt of Chigger Ridge Ranch Boer Goats at The 2018 Cowboy Classic sale. Gypsy Rose is a direct daughter of the great Smokin Hot Ruger Ennobled and she is on her way to be ennobled. We purchased Sparkler from Windy Ridge Livestock at the Midwest Producers Classic. Sparkler is a Cane Creek bred do out of Max Boer Goats IMAX Vegas. 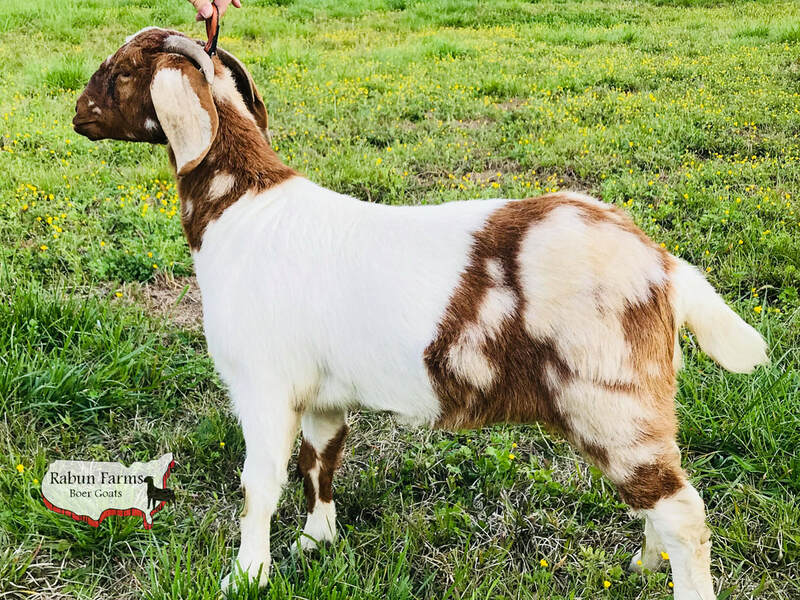 We purchased Kangaroo from the 2017 Fall Into Colors Boer Goat sale from CBF Boer Goats. We purchased her at 6 months of age and grew her out. She is a Farm favorite! Sun is sired by Cadillac Jack and is full of Max Boer Goat genetics. We purchased Sassy from the Southern Boer Blitz Sale in 2016. Sassy came from Stovalls Red Creek Farms, she is sired by the late RCFM Whizzy Boy. We purchased Rubey from the GA Peach Production Sale from Logan King. Rubey is Sired by STAR GAZE SPOTTED SMACK ATTACK which has a very nice colorful background. Sweetie is direct out of the CODI line that started it all. She looks to be traditional in the picture but she actually Red Cape Cod.